Over the years and as a result of various factors from the environment the skin changes the appearance and condition. We can notice stains, freckles and other irregularities appear on our face. Do not despair if a notice this on your face – there are completely natural ways to restore the face healthy, fresh and clean look. This homemade parsley toner is one of them! In addition it will help you to whiten and clean the skin, it will eliminate the pigmented spots, freckles and it will restore your healthy complexion. With just a little effort you can prepare the parsley toner and use it every day! 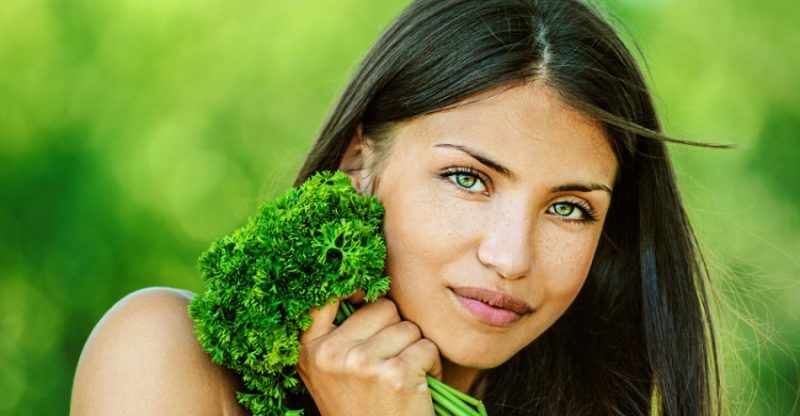 Why is parsley so good for the complexion? Parsley is rich in vitamins and minerals, and its juice contains essential oils with a high content of potassium and manganese. In cosmetology parsley has always been known for its whitening and regenerative properties. It eliminates redness, irritation and swelling, refreshes and tones. It also protects the skin from the appearance of wrinkles. It is excellent for the care of the sensitive eye area. Also it helps eliminate acne and blackheads. Preparation: Pour boiling water over the parsley and cook on low heat for 15 minutes. Remove it from the heat and let it cool. Then strain it and add lemon juice or apple cider. Keep it in the refrigerator for 5-6 days. Use the toner every morning and evening by applying it on a piece of cotton pad and rub the whole face. After a month you’ll notice that the spots and stains from the face will disappear. If you want to eliminate the dark circles and redness of the eyes, make the same toner, but without the addition of lemon juice. Soak cotton swabs in this lotion and put on the eyes in the morning and evening, leaving them for 5 minutes.